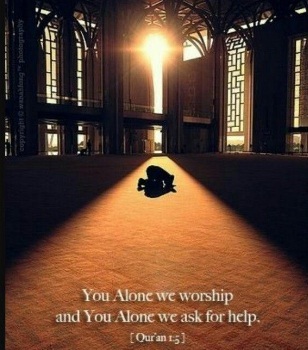 Sujood or prostration is the essence of the Monotheistic prayer or salah. As someone rightly said: "Prostrate as much as you can in your youth as I have seen many unable to prostrate during prayers in their old age." Right on! Old age brings with itself various physical limitations. Thus, take advantage of your healthy physical state when young and perform as much sujood as you can. Furthermore, old age is not guaranteed to anyone. 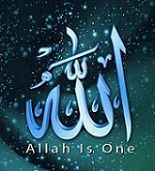 It's only the Will of Allah. Sujood (prostration) is truly a humbling experience. We can beg for Allah's forgiveness and shed tears for our misdeeds as well as seek refuge in Allah from the ultimate punishment of Hellfire. During sujood we are in one of the most submissive physical positions. It offers one of the best opportunities to talk to Allah and ask for His forgiveness and guidance. This prerogative is not confined only for the month of Ramadan but for all times, as long as we approach Allah (only) with a sincere, humble and contrite heart. We simply require to get close to Allah through sujood as often as possible during whatever number of remaining days each one of us have in this fleeting earthly life. From Quranic narrations it's clear that sujood is something which every Prophet performed. "These are they unto whom Allah showed favor from among the prophets, of the seed of Adam and of those whom We carried (in the ship) with Noah, and of the seed of Abraham and Israel, and from among those whom We guided and chose. When the revelations of the Beneficent were recited unto them, they fell down, adoring and weeping." (19:58). "And David guessed that We had tried him, and he sought forgiveness of his Rab, and he bowed himself and fell down prostrate and repented." (38:24). "You (O Muhammad) see them bowing and falling prostrate (in worship), seeking bounty from Allah and (His) acceptance. The mark of them is on their foreheads from the traces of prostration. Such is their likeness in the Torah and their likeness in the Gospel" (48:29). All above Verses of the Noble Quran are clear indications that all Prophets performed ruku (bowing) and sujood (prostrating) for the love, appreciation and forgiveness of Allah. If your prayer (salah) isn't a mindless ritual, you will observe that there's hardly a time you feel closer to Allah than when you are in sujood. It's the sincerity and humility of the heart that combines with our sujood and brings us close to Allah as during no other time of our earthly lives. Who are humble in their prayers," (23:1-2). Humility is of utmost importance at all times and especially during prayers, and sujood is an inseparable part of the Monotheistic prayer. Sujood is also a gesture of gratitude. Many believers fall prostrate before The Almighty as soon as they learn of some good news .. often referred to as Sajdat-al-Shukr. Believers who have truly submitted to Allah often fall prostrate while reciting the Noble Quran. When you're reciting the Quran and the Beauty of this Message sinks within you as you read, there's a strong urge in the believer's heart to fall prostrate every now and then. This is referred to as sajdat-ul-tilawat. "Only those believe in Our revelations who, when they are reminded of them, fall down prostrate and hymn the praise of their Rab, and they are not scornful," (32:15). The Noble Quran has clearly conveyed that it's not only humans who perform prostration to Allah but so do all other living beings. "And unto Allah make prostration whatsoever is in the heavens and whatsoever is in the earth of living creatures, and the angels (also) and they are not proud. They fear their Rab above them, and do what they are bidden." (16:49-50). 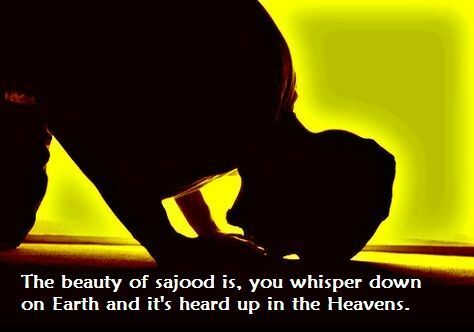 As the saying goes, the beauty of sujood is that you whisper down on earth and it is heard up in the Heaven. Prostration before The Almighty is of the greatest of importance as contained in His Final Message. Prostration is a time when the heart is expected to be at its sincerest. Therefore, seek solace in sujood, and never let your mind wander while you are prostrating, rather utilize this opportunity to fill your heart with the thought of Allah The Almighty. "And unto Allah fall prostrate whosoever is in the heavens and the earth, willingly or unwillingly, as do their shadows in the morning and the evening hours." (13:15). "Say: Believe therein or believe not, lo! those who were given knowledge before it, when it is read unto them, fall down prostrate on their faces, adoring," (17:107). "Nay, Do not obey him. But prostrate yourself, and draw near (unto Allah)." (96:19). Question concerning the Sajdah -e-Tilawat ? Can prostration (sajood) be of two types? Love this piece wholeheartedly. And yes, Sujood of the heart; one doesn't need to worry if one is physically unable for whatever reasons. Sujood dwells in the heart of a believer. It comes with the same devotion, love and hope by a slight bending of the head or a movement of the eyes. Alhumdulilah. Sujood is the only true therapy for the soul. Indeed a very soothing post. With hurting stiffness in my knees, I have been forced to offer salah in the chair for quite long. And believe me, Sujood of the heart has been just as much a source of profound peace as performing Sujood the regular way. You're welcomed dear Sis May Allah Almighty always grant you good health and peace. Ameen ya Rab. Ameen. The same dua from me too Sister Zeynab. Yes, the physical obstacle on performing Sujood is usually because of painfully stiff knees, not so much the back problem contrary to the common assumption. My brother has much the same problem and also offers salat sitting in the couch. Many thanks for the dua, dear sisters. Yes sister Ruhi, you're absolutely right. And may Allah Almighty grant health to your dear brother too. Ameen. So exhilarating. Though physical prostration feels the most wonderful, Sajood is primarily in the soul. There are several elderly persons in my family who are too frail to sit on the prayer mat and prostrate physically. They sit on a chair or couch and offer salat and perform sajood bending a bit and it brings a world of difference in their emotional state. They feel so much more at peace with themselves and the outside world ..... like don't care for the ups & downs of this world .. just go thru it as best as you can ... ultimate journey is bound to come and that's the real destination for permanent living. Agree with you 101% dear brother. That's precisely it. Praise be to HIM and HIM alone. May The Almighty bless your mom and grant her good health. Ameen. Ameen, ameen. Thanks a lot Sister Zeynab. May Allah Almighty bless you too. Ameen ya Rab, ameen. May Allah The Greatest grant the strongest of iman and good health to all our elders, to us and to our children. May we all meet in Jannah one day; that will be the Real Meeting and for that we need to work hard on our conduct and hope for forgiveness (مَّغْفِرَة) from HIM. This world is all about worrying for our tomorrows and getting torn apart from family & friends in search of ambitions or simply making a living. Ya Rab, accept my sajood, my prayer. I'm just a beggar, begging before YOU. Among the sweetest words told .. the most truthful and soothing summary ever. Ameen ya Allah, ameen, ameen. Indeed, truthful & deeply comforting. What most folks need is courage to face the struggles of this life which plays a prime role getting them distracted from the Truth. Exactly, you hit the right point brother. InshAllah, we keep holding on to Allah and He keeps supplying us with courage. Right Sister, we're beggars before HIM.